Many dancers face the dilemma: college education or dance career? Dance may be something about which they have always been passionate and dedicated, but perhaps dancers cherish the idea of a college degree, or maybe they have even had their time in a professional dance company but seek what’s next. In any case, Columbia Ballet Collaborative (CBC) is a college dance company that may offer dancers the best of both worlds – the experience of a performing company while pursuing a college education. CBC is a student-run dance company out of Columbia University in New York City. It was formed in 2007 by five professional dancers-turned Columbia students. CBC offers students, regardless of major and professional experience, the opportunity to work with New York-based, up-and-coming choreographers in the creation of new contemporary ballet works. 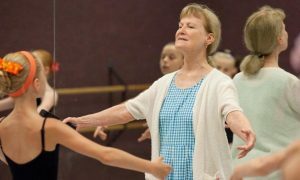 Members of CBC come from a diverse range – some have danced professionally, some came straight from high school and some hope to dance professionally after college. All CBC members, however, are passionate about dance and work together in a non-competitive, collaborative effort to present quality dance for themselves, for the Columbia community and even for the NYC public. This year, CBC, led by Artistic Director Rachel Silvern (a term that lasts one year), will offer fall and spring performances, featuring the work of a handful of choreographers. It will also continue its outreach program with second graders at PS 175 in Harlem, perform excerpts of The Nutcracker for Columbia students, hold free, weekly ballet classes for the entire Columbia undergraduate and graduate community, and will join forces with dance companies from other Ivy League schools for a mixed-bill program in February. CBC performs George Balanchine’s ‘The Four Temperaments.’ Photo by Joseph Ritter. If it seems that the students who run CBC must be all-encompassing, it’s true. In fact, Victoria North, one of CBC’s founding members who came to Columbia after dancing with Aspen Santa Fe Ballet and Complexions Contemporary Ballet, says that one of the reasons CBC was created was to give students an opportunity to be involved in all aspects of running a company: choreography, fundraising, public relations, outreach, artistic decisions and more. North, who has since graduated from Columbia’s School of General Studies (GS) in 2010, with a degree in Neuroscience and Behavior, is now in her second year of medical school at Columbia’s College of Physicians and Surgeons. In fact, like North and Silvern, most CBC members have non-dance majors. But that is not to say they’re not as serious about their work with CBC. They are simultaneously dancers and scholars. Rebecca Walden, a CBC dancer since her first semester at Columbia and an Anthropology major at GS, says that CBC is especially unique because the dancers have often had immense professional experience. Dancers have come from Tulsa Ballet, Oklahoma Ballet, North Carolina Dance Theatre and more, and some currently work as freelance dancers in NYC. Walden herself came from Columbia Classical Ballet and Nevada Ballet Theatre before pursuing her studies at Columbia. As a recognized student group of Columbia, CBC does receive an allocation each year from the Activities Board. The company also applies for grants each semester and gets a gift from the Gatsby Charitable Foundation, but CBC’s student board must do the remainder of the fundraising themselves to pay for the costs of commissions, costumes, press materials and theater space. Columbia’s Barnard College Dance Department provides studio space to CBC, and the company sometimes performs at the Miller Theater on campus. CBC dancer Rebecca Walden rehearses a work by Sarah Esser in spring 2013. Photo by Joseph Ritter. CBC holds auditions each semester, and the group is usually comprised of about 30 dancers. There are also leadership roles within the company: artistic director, assistant artistic director, director of public relations, fundraising director and more. CBC holds one performance each semester (one in November and another in May), and works with a different batch of choreographers each time. This fall, CBC will feature new works set by six choreographers: Devin Alberda, a member of New York City Ballet; Richard Isaac, a former Kansas City Ballet and Tulsa Ballet dancer and currently a Columbia student; Ja’Malik, a former dancer with Cleveland Ballet and Ballet X; Dan Pahl, a Columbia University senior; Donna Salgado, artistic director of CONTINUUM Contemporary/Ballet; and Claudia Schreier, a Harvard graduate and recipient of the Suzanne Farrell Dance Prize in 2008. Although it may have proved a bit difficult to initially get CBC off the ground, the company is now flourishing and becoming an important facet of the Columbia community – for both dancers and non-dancers – and of the NYC public community. Come out and support these hard-working dancers, students and people, and the choreographers who embrace their vision, at CBC’s Fall 2013 Performances, which will culminate on Friday, November 22, and Saturday, November 23, at 8 p.m., at Manhattan Movement and Arts Center Theater. Tickets are $10 with a Columbia University ID and $20 for the general public. Ticket information is available here: www.columbiaballetcollaborative.com/performances.html. Photo (top): CBC rehearses Les Ballerines, choreographed by Columbia student Caitlin Dieck (GS ’13). Photo by Joseph Ritter.